Claxton will temporarily grow by more than five times March 14-15, thanks to the 48th Annual Rattlesnake and Wildlife Festival. The event held by the Evans County Wildlife Club in the nearby Hagan community drew at least 16,000 people last year (Claxton had a population of about 2,700 in 2010). Compared to the 2014 turnout, club marketing manager Bruce Purcell is "hoping for a good bit more” this year. The crowd has grown since organizers stopped buying and selling wild-caught rattlers in 2012, a practice rated harmful to many native species including gopher tortoises, whose burrows are used by snakes and other wildlife. 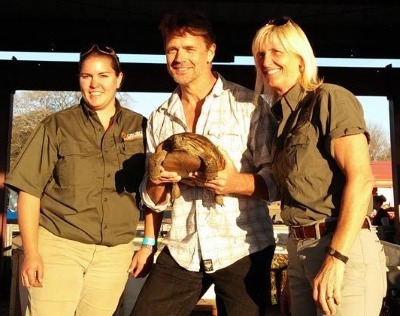 The switch from rattlesnake roundup to educational wildlife festival led to strong support from conservation organizations, and even more rattlesnakes. “They bring in more snakes (for exhibiting) than when we were hunting ’em,” Purcell said. Devil’s Backbone Hunting Club members didn’t know their middle Georgia lease had golden eagles. But two days after putting out road-killed deer as bait in a project studying the continent's largest raptors, one showed up on camera. "Would you believe it?” writes club president Jodi Killen. Few might have in a state where you can count the golden eagle sightings each year on one hand. The project teaming West Virginia University, DNR’s Nongame Conservation Section, Cellular Tracking Technologies and Devil’s Backbone Hunting Club is changing that perception. One of possibly as many as four golden eagles visiting the bait and blind site set up by the club was trapped and now wears a device that transmits the 5-year-old bird’s location, elevation and speed every 15 minutes (watch the release). Nongame Program Manager Jim Ozier has a second transmitter, also paid with a TERN grant, if another eagle is caught at the site near Sprewell Bluff Wildlife Management Area next winter. The area features a mix of rugged mountains and open woodlands, apparently prime habitat for golden eagles. 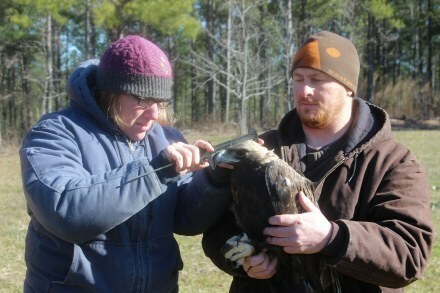 The Devil’s Backbone eagle is the first from Georgia tracked in an effort that has documented eastern North America’s golden eagles and their migration routes since 2006. The work has branched out from Pennsylvania into states as far south as Alabama, and into scores of camera “traps” that photograph golden eagle visits and, as of last year, tracked about 30 birds bearing phone-sized transmitters that link with the nearest cell tower. Initially aimed at exploring threats that wind turbine sites pose to the birds, the project is providing details about golden eagles that migrate from Canada – including the revelation that not all follow Appalachian Mountain ridges. Some cut through the Midwest, according to project leader Dr. Tricia Miller of West Virginia University. While golden eagles are more common west of the Mississippi, they’re also found in Mexico, Asia, Europe and northern Africa. Blood samples from the eagle caught Feb. 15 at Devil’s Backbone revealed the lowest lead levels Miller has seen in a golden eagle. Raptors can be poisoned by eating carrion killed by lead shot. A fresh bait pile is key for attracting the eagles. The club picked up about 30 deer, networking with Klaus and local law enforcement, including Georgia State Patrol Post 34 in Manchester, to find new road kills. Jim Ozier releases the tracked eagle. Young golden eagle visits the bait pile. See more bait pile videos, including squabbling hawks, on the club’s Facebook page. About this time of year I find myself yearning for signs of spring. About the same time, I begin thinking about nesting boxes. Now, when such thoughts start swirling around in our heads, we wildlife enthusiasts automatically tend to envision bluebird nesting boxes. 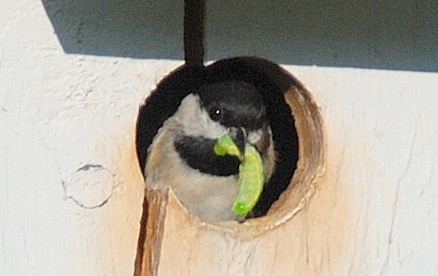 But there a host of cavity nesting birds in Georgia that benefit from nest boxes. Read Terry’s column to learn about these perky birds, and how you can help them. Terry W. Johnson is a former Nongame program manager with the DNR Wildlife Resources Division and executive director of TERN, the Nongame Conservation Section's friends group. Out my backdoor library. 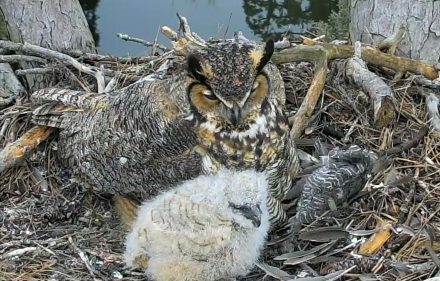 In case you weren't watching, great horned owlets at The Landings near Savannah have been mugging for for nest cam viewers, while bald eaglets at Berry College have revealed the harsh side of survival in a raptor nest (part of a real-life drama that drew CNN's attention). You can also watch both cams here. Deadlines are drawing near for three of Georgia’s most popular birding and art competitions. Entries in DNR’s 10th annual Youth Birding Competition T-shirt Art Contest are due March 9, while teams must sign up by March 31 for the 24-hour birdathon. Deadline to enter the silver anniversary version of the Give Wildlife a Chance Poster Contest, also sponsored by the State Botanical Garden of Georgia, is April 10. Student artists interested in the U.S. Fish and Wildlife Service’s 2015 Georgia Junior Duck Stamp competition have until March 16 to try for recognition as one of the state’s top 100 artists – or even best of show. Critical habitat for endangered North Atlantic right whales would grow by nearly 30,000 square nautical miles under a NOAA Fisheries proposal for the northwestern Atlantic. The expanded area would include calving grounds reaching from North Carolina, through Georgia, to northern Florida – the only known place this species calves. 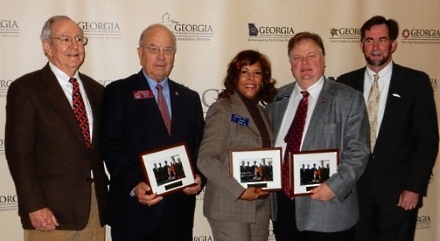 Weekend for Wildlife again proved a winner for the Georgia Nongame Wildlife Conservation Fund. 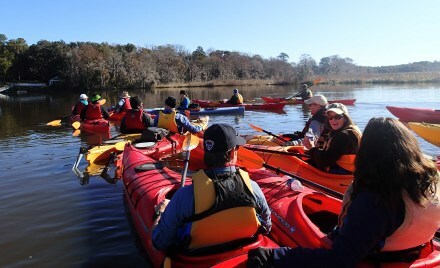 Guests enjoyed trips such as an Altamaha River kayak tour (above) and Sea Island banquet with Gov. Nathan Deal as part of the Feb. 6-7 fundraiser critical to the DNR Nongame Conservation Section, which receives no state appropriations to conserve rare and other nongame species. 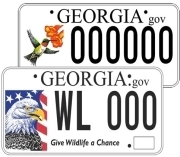 Georgians can easily support the Wildlife Conservation Fund when filing their state income taxes. 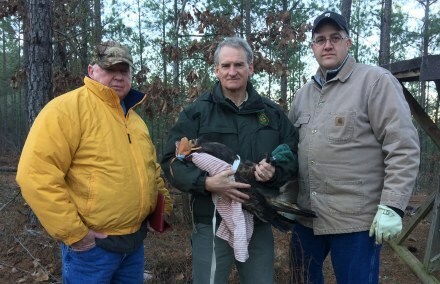 Donations to what's often called the Give Wildlife a Chance tax checkoff, line 26 of Georgia’s long income tax form (Form 500) or line 10 of the short form (Form 500EZ), accounted for 10 percent of the money raised for conserving nongame in fiscal year 2014. Nongame Conservation Section annual report. Gov. Deal recognized three corporate forest landowners this month for their land stewardship practices benefiting Georgia’s wildlife. Plum Creek, Georgia Power and CatchMark Timber Trust were honored as 2014 partners in the Forestry for Wildlife Partnership, a voluntary program through which the three had a positive impact for wildlife on more than 1.05 million acres. Partner photos. Names in the news: TERN’s Brooks Schoen (above, far left) and DNR Commissioner Mark Williams (far right) honored Rep. Bubber Epps (left to right in center) and Sens. Horacena Tate and Jeff Mullis during the Jan. 15 Sportsmen’s and Coastal Day at the Capitol for their leadership involving last year’s House Bill 881, which lowered the price of DNR wildlife tags to $25 and dedicated most of the fee to programs the tags sponsor. Earlier this month, former DNR Deputy Commissioner Homer Bryson was appointed Department of Corrections commissioner, and Walter Rabon, formerly a major in the agency’s Law Enforcement Division, was named deputy commissioner. DNR Ranger 1st Class Fred Hays has been named the Law Enforcement Division’s 2014 Ranger of the Year. Neal Edmondson, Prescribed Fire Program manager for the Georgia Forestry Commission and a longtime advocate of prescribed burning in the state, is retiring. The U.S. Fish and Wildlife Service’s Southeast Region recently honored Reggie Forcine, lead forestry technician for the Okefenokee National Wildlife Refuge fire crew, with the Regional Prescribed Fire Leadership Award. Correction: A tri-colored bat was incorrectly identified in a photograph in the Jan. 29 issue. Bird banding times, dates at Panola Mountain State Park, Stockbridge – Feb. 28, 6:30 a.m.; March 7, 7 a.m.; March 14, 6:45 a.m.; April 18, 6 a.m.; April 25, 6 a.m. For updates, including schedule changes: Charlie Muise, Georgia Important Bird Areas Program. March 25: South Georgia Native Plant & Wildflower Symposium, National Environmentally Sound Production Agriculture Laboratory, UGA Tifton campus. May 9: JAKES Day, 10 a.m.-2 p.m., Charlie Elliott Wildlife Center, Mansfield. Prescribed fire enjoyed its week of fame as Gov. Nathan Deal and advocates declared Feb. 2-8 Prescribed Fire Awareness Week in Georgia. “Prescribed burning of Georgia forest lands is a valuable tool for protecting the forest from devastating wildfires and managing valuable wildlife species,” reads the proclamation Deal signed Feb. 4 at the State Capitol. Established in 2005 through the work of the Georgia Forestry Commission and the Georgia Prescribed Fire Council, Prescribed Fire Week is observed during the first full week of February. The focus recognizes prescribed fire as a safe way to apply a natural process, ensure ecosystem health and reduce wildfire risk. Crews from DNR and other agencies and nonprofits are in the thick of the burning season. In helping restore and maintain fire-dependent habitats, such as sandhills and turkey oak scrub, the fires benefit animals and plants that need those habitats. 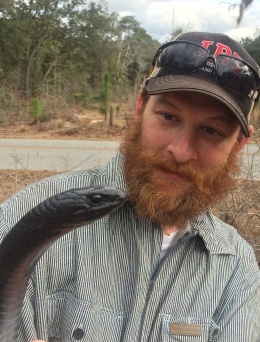 DNR burn boss Shan Cammack, chair of the Prescribed Fire Council, shot this video of a 5-and-1/2-foot eastern indigo snake slithering into a gopher tortoise burrow at a fire-managed site in southeast Georgia Monday. (The video has fielded more than 1,700 likes on Facebook as of today!) Seasonal fire crew member Bryn Pipes briefly went eye to eye with the snake (below). Eastern indigos – federally listed as threatened – are associated in Georgia with longleaf pine habitats. Indigos and all other native non-venomous snakes in the state are protected by law. plus Georgia's native plants and natural habitats. Annual report.